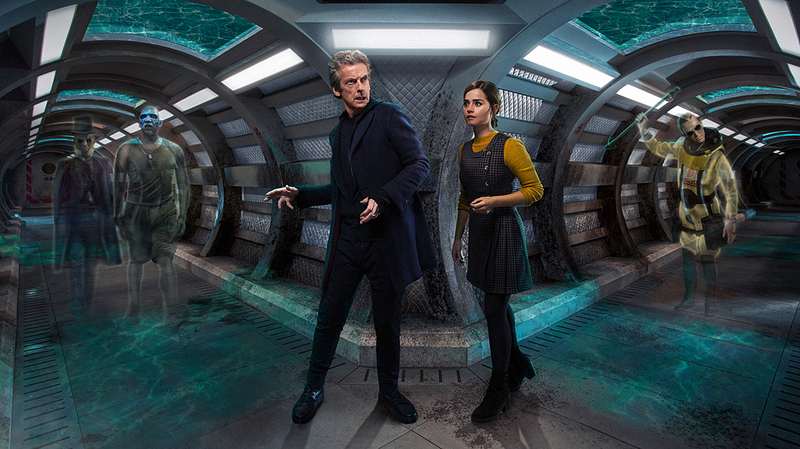 Another two parter for Series 9 and another great addition to the Capaldi era. I was really looking forward to this story to begin with, as the idea of a reverse two-parter sounded unique, as well as the back to basics style of the first part. As I said last time, Series 9 started brilliantly, and thanks to this two-parter it seems the series will continue the trend of being awesome. All it needs is 8 more awesome episodes to beat Series 4 as the best series of the new series. One thing which is great about the story is the basic story structure in part one. I love a good base under siege story and Under the Lake was a prime example of one. The ghosts are very creepy and effective as a threat, and I like how they weren’t underused or pushed to the side, yet they didn’t dominate the screen and still allowed for some character moments. The story seems to be continuing the trend of Series 9 scripts of subtly introducing character themes and ideas for the finale. In particular, Clara’s obsession over travelling and her increasingly cold nature to the people around her show that she is becoming more detached. In contrast, the Doctor is becoming more calm and more thoughtful, but he is still the Twelfth Doctor we know and love. In particular, him manipulating O’Donnel to test his ghost’s message and him having no empathy for his actions harken back to Into the Dalek and Kill the Moon. Despite this, he is still a hero, confronting the Fisher King and condemning his actions. He is swiftly becoming one of my favourite Doctors. The Fisher King is a great but underused villain. I love the use of practical effects and costumes in the show recently, as many memorable monsters in recent memory have been practical. The Teller, The Foretold and now the Fisher King all harken back to Classic Series monster designs. I also like how he killed Prentis and O’Donnel as well as the parallels between him and the Doctor- both are warriors who will do anything to survive. Despite this, he was underused and I would have liked to see more of him, especially seeing how he is one of the coolest looking monsters in recent memory. Thankfully the ghosts are menacing enough to give the story a good enough threat. The supporting cast is probably the best since Mummy on the Orient Express. All the characters are very believable and likeable, except for Pritchard, who is such a cliche that the moment he appears I knew he was going to die. The other crew members are very good though, especially Cass, who gets a brilliant scene in Before the Flood. It’s a unique scene and is very tense. The great thing about a two parter is that it allows characters to be expanded upon and make the audience care for, and this story proves that two-parters work and should be used more often. Thankfully there will be more in this series. I also really like the idea of the Bootstrap Paradox and how it ties in with the story. 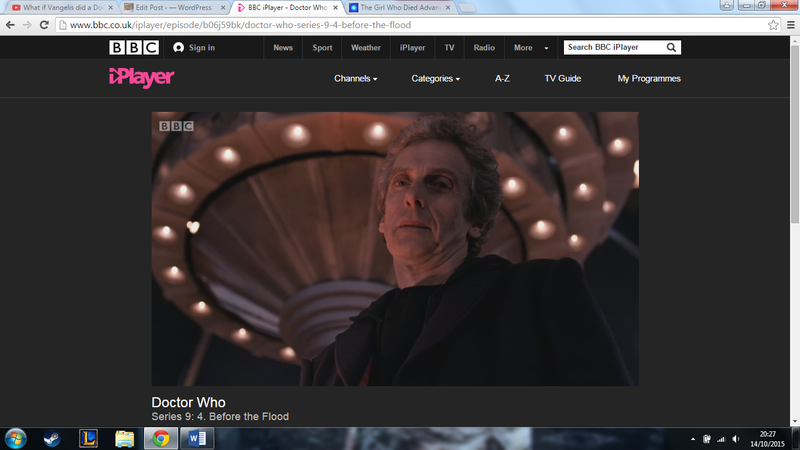 The solution to everything is very clever, as the Doctor uses the events of Under the Lake to defeat the Fisher King. The whole idea of the hologram and sending himself information in a stable time loop was very clever and fun, and was definitely the kind of story only Doctor Who could get away with. Cass being hunted by Moran. The Doctor and Clara’s phone call. The Doctor’s speech to the Fisher King. The Doctor telling Bennet that history cannot be changed. Overall, this was another great addition to the series. It was a fun and unique story with one of the best uses of timey wimey in recent memory. While the Fisher King is underused and the story does have an exposition problem (all the information is revealed right at the end), it still is able to be a worthy addition to Capaldi’s era. 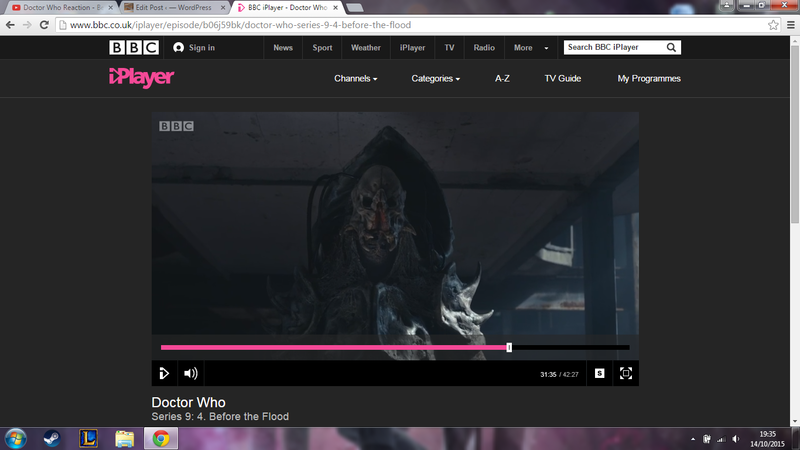 I hope by the end of the series I can call Series 9 my new favourite series. I have absolutely no idea what you’re talking about Ben, but your post is really well written so I enjoyed reading it even though it’s all gobbledygook to me!! !